Scientifically classified in the order Cetacea (whales) and sub-order Odontoceti (toothed whales), bottlenose dolphins and porpoises share key characteristics. They are both mammals and nurse their calves. They have lungs and breathe air, yet are completely adapted to life in the water. They’re smaller than whales with teeth in both jaws, and they both have a dorsal fin in the center of their backs. However, bottlenose dolphins and porpoises are completely different species, classified in different families, with major distinctions in their physical characteristics, social behavior and life span. The bottlenose dolphin (Tursiops truncatus), also known as Atlantic bottlenose dolphin, is among the 33 species of the family Delphininidae, and one of the most recognized oceanic dolphins. Only six species of porpoises comprise the family Phocoenidae. Also called “true” dolphins, bottlenose dolphins are distinguished easily from porpoises by their overall appearance. 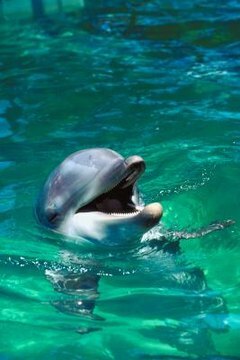 Dolphins have prominent beaks (rostrums) and bulbous melons (fatty organs in the forehead) that clearly define their head. Porpoises have small, rounded heads on short, immobile necks that make it virtually indistinguishable from their bodies. Most species have blunt snouts without beaks. Famous for their intelligence and charisma, the bottlenose dolphin has upward-curving lips that look as if it is perpetually smiling. Porpoises have short mouths and inward-curving lips that make them look less friendly than dolphins. The bottlenose dolphin is sleek and 10 to 14 feet long, weighing about 1,100 pounds. Porpoises have short, stocky bodies about 5 to 6.5 feet long, and weigh from 110 to 200 pounds. The dolphin’s dorsal fin is curved and wave-like, while porpoises have triangular fins. Dolphin teeth are conical with points, while porpoises have laterally compressed teeth shaped like spades with sharp edges on each tooth. Bottlenose dolphins travel in social groups of about a dozen individuals, called pods. Sometimes hundreds gather together, forming a super-pod. Dolphins appear to like people and are known to tag along with boats, entertaining the occupants with spectacular jumps and dives. Porpoises are shy animals that travel in small groups, called shoals. They may live alone, with one other, or in small groups, depending on the availability of food. They avoid boats and, unlike dolphins, seem to fear humans. Scientists know much less about the behavior of porpoises in the wild than dolphins, due to the porpoises’ retiring nature. The average lifespan in the wild of the bottlenose dolphin is between 45 and 50 years, while porpoises live only about 20 years. Dolphins World: What is the Difference Between a Dolphin and a Porpoise?